عندما تزور كالبارى, ستشعر أنك في بيتك في Kalbarri Reef Villas الذي يقدم لك إقامة متميزة و خدمات عظيمة. يمكن من هنا للضيوف الاستمتاع بسهولة الوصول إلى كل ما تقدمه هذه المدينة النابضة بالحياة. بالنسبة لمن يريد الخروج، هذه بعض المعالم السياحية المتوفرة للزوار ‪Meanarra Hill Lookout‬, ‪Hawk's Head Lookout‬, Paul's Gallery. استمتع بالخدمات الراقية والضيافة التي لا مثيل لها بهذا الفندق في كالبارى. لضمان راحة ضيوفه، يقدم الفندق الخدمات التالية: واي فاي مجاني في جميع الغرف, واي فاي في المناطق العامة, صف السيارات, التوصيل من وإلى المطار, مرافق للشواء . استمتع بوسائل الراحة الراقية في الغرف أثناء إقامتك هنا. بعض الغرف تتضمن تلفزيون بشاشة مسطحة, غرف لغير المدخنين, مكيف هواء, تدفئة, شرفة/ تراس لمساعدتك على استعادة طاقتك بعد يوم طويل. يمكنك طلب اللائحة الكاملة للخدمات في الفندق ومن بينها حمام سباحة خارجي, حديقة. 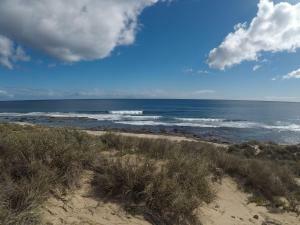 إن Kalbarri Reef Villas هو خيارك لخدمة الفنادق الراقية في كالبارى. They are under the progress of changing management . They left a note outside the door and I need to call them to get my room number and so on . They supposed to inform me earlier and I would look for other options. The floor are dirty, some corners in the villas with spiderweb and dust. Not sure how long it been abandoned... I'm quite disappointed with the management .. Plenty of space for a 2x2 family with older children. Pool, parking and facilities all good. We enjoyed our stay. Well located, comfy beds, fully equiped appartements. Great for families or couples who doesn't want to camp and look for comfort while travelling the coast. Washing machines available for free and there are brand new. Room that we get is totally unacceptable which inside is still doing some minor renovation. After that, we change to the new house, the water for shower head is really small until we have to use water tap to shower. The main living area was quite dark as it had a dark wood ceiling and 3 side lights, which we had to keep on during the day. The windows were not sealed and were glass moveable slats which let in a draft and kept the rooms cold, although expect it is a bonus when the weather is very hot. It was completely full so they must be doing something right, but not somewhere I would return to. There were considerable more options for accommodation than I appreciated when searching online, maybe I didn't find them all to compare, or I was price driven, so maybe price restricted my options. Slept well and would be fine for a one night stay. Didn't use the pool or laundry facilities but they looked great. We were originally given Villa 1 which had a door issue (we had difficulty opening the door cause of the missing knob) and when we finally got the door open, we subsequently had ourselves locked inside. The staff at the hotel however was quick to remediate the situation by changing our rooms. The villa itself was cozy. The ground floor living area and kitchen was spacious. 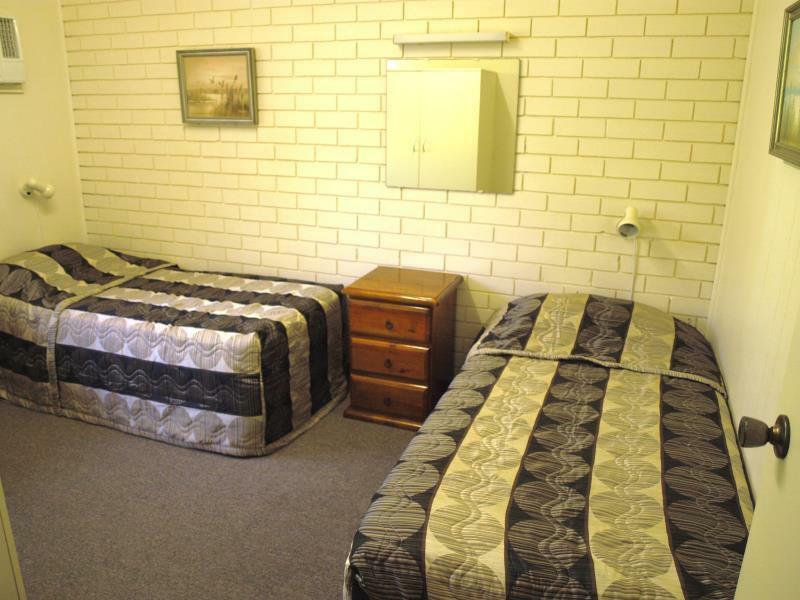 Though the rooms upstairs were small, the beds were comfortable enough for our short stopover in Kalbarri. We enjoyed our stay in the Reef Villas. Value for money was there but there is definitely room for improvement. For example, shampoo would be nice and daily replenishment & cleaning of the villa. I also agree with other reviews that downstairs was way too dark during the day. There must be some way via a modified skylight to brighten up the place. The main bedroom also had a large wardrobe that got in the way when I was moving to my side of the bed. WiFi was also rather hit and miss at times - not sure why? The place could definitely do with a face-lift. But the staff were very friendly and helpful. The poor manager though seemed a little run off her feet and hard to get hold of at times. Overall, if you are on a budget it would be a place to stay. Had lots of room for family very old in need of update but only paid $145.00 a night in school holidays so did not expect 5 star if u are go elsewhere and pay a lot more. We stayed just one night but it was very pleasant. Rooms were clean and spacious. Location was great. We wanted to stay longer. The only thing going for this property is location!dishes were filthy and had water laying on them in the cupboards. Spent the first night having to scrub the kitchen which was poorly equiped with very dated random dishes and nothing suitable for kids to use. Dead cockroaches in the wardrobe on bedding, spiders and spider cocoons throughout the villa. Is always very noisey upstairs you can hear absolutely everything below and wall between bedroom may aswell be a cardboard box! Not suitable for families with kids at all too many hazards. Every piece of furniture fit for the bin, stained or broken! Staff were really nice and gelpful but property is in very bad state and not equiped at all! great place to stay, nice and relax.. love the beach.. walking distance to the beach and nice sunset..